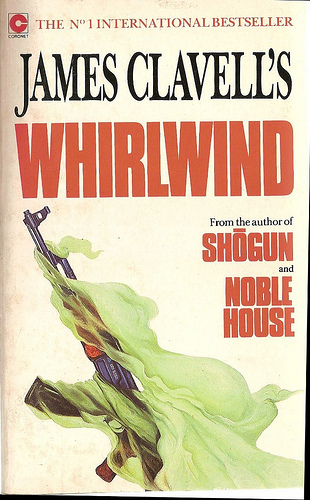 With everything that’s a mess going on in the Middle-East, I decided to reread Whirlwind. It’s about the Iranian Revolution in ’79, almost a year before the hostage crisis began, and like all of Clavell’s novels based on true events in a “clash of cultures”. Everyone knows Shogun, and Whirlwind has the similar theme of western people struggling in a hostile land they can barely make sense of. Instead of a sea pilot visiting Japan, it’s now helicopter pilots working for Iran Oil, and the story is their escape from a nation being strictly taken over by Islam. What strikes me rereading it today is the different thrust it carries from the other novels. Clavell was known for building bridges between East and West, but he seems to have been more intent on burning bridges when it came to the Middle-East. Shogun and Tai-Pan are about cross-cultural fusion: the western protagonists remain in Japan or Hong Kong, meshing their western outlook with revelations in the east. They take the good and discard the bad from both. Whirlwind advances the opposite impression: there can be no such optimistic marriage with Islamic countries. Why the concern about “disrespect”? Clavell was writing in the ’80s, long before the politically-correct climate of the late ’90s and post-9/11 — hell, even before the fatwa was issued against Salaman Rushdie. It’s as though he had a crystal ball and saw a time when portraying militant Islam, or to even hint that Islam wasn’t a “religion of peace”, could get you branded a bigot. What was it Rodrigues had said? “The Japans are heaven on earth, Ingeles, if you know where to look,” or “This is paradise, Ingeles.” I don’t remember. I only know it’s not there, in England where I thought it was. It’s not there. Heaven on earth is here. Tai-Pan moves us similarly. Dirk Struan embraces much from the Chinese (not least, amusingly, his requirement that seamen on his ships use toilet paper to wipe their asses), and like Blackthorne represents a forerunner of multiculturalism — though devoid of moral relativism. Multiculturalism, for Clavell, involves the cost of choice at every turn. It means recognizing this lifestyle as better, and that value as superior, so that something always has to go. There is also the moment (in chapter 31) when Blackthorne is “reborn” after trying to commit ritual suicide, unable to bear the shame of an entire village being threatened with crucifixion if its people don’t teach him Japanese satisfactorily. It begins as a ploy, a threat to kill himself if Lord Yabu doesn’t remove the sentence, but Yabu wants to see if this western barbarian can really go through with it. Blackthorne does, to everyone’s shock, and the attending samurai barely manage to intervene and stop the blade in time; he wounds himself seriously and passes out. When he awakes, he is accepted for the first time as a civilized man. The ritual of seppuku emerges as a transcendent experience envied by others — “his senses now on a plane never reached by one who had not gone freely to meet death, and through an unknowing karma, come back again”. A closer analog to Blackthrone and Struan is Tom Lochart, the Canadian pilot in love with an Iranian woman, and despised by members of her family for being non-Muslim. His sudden conversion to Islam comes toward the end (chapter 67), when he makes the drastic choice to stay in Iran as the other pilots bail. The room was very still. For an eternity Tom stood there. Then, all at once, his being swept him into new waters. In a strange clear voice he said, “Bear witness for me: I attest that there is no other God but God and Mohammed is the prophet of God… I attest that there is no other God but God and Mohammed is the prophet of God…” and the third and last time. Now it was done. He was at peace with himself. He saw them staring at him. Stunned. Meshang broke the silence, no longer in anger. “Allah-u akbar! Welcome.”… All were spellbound that they had witnessed a soul being saved, an unbeliever transmuted into a believer, so unexpectedly. Lochart’s conversion is obviously skin-deep, and not grounded in any genuine feel for Islam. It’s a desperate move so that he can remain with Sharazad and be accepted by her family. It moves us, to be sure, because we care for him and Sharazad, but a future for them in Iran holds little promise. The bomb explosion that kills them two chapters later seems almost a mercy. In the post-9/11 age it’s become fashionable for novelists and filmmakers to couch Islamic fundamentalism, jihad, and terrorism more in terms of grievances against western powers than in terms of Islam itself. Whirlwind does both, so that it’s not always clear which interprets the other. On the one hand, Clavell juggles regional and world politics with his typical genius, portraying the various anti-Shah factions who are also at each others’ throats — Islamic followers of Khomeini, Islamic Marxists, and Tudeh communists. We glean much of this through the eyes of a colorful character named Abdollah Kahn. He’s a double agent working with Soviet agents in Tabriz against Khomeini, but as a Muslim just as militant he manipulates these Soviets whom he perceives as an even worse threat than Americans. We see the fatal outworking of politics in other cities too, especially Tehran. On the other hand, there’s a keen sense that Islam transcends political grinds, and that the Iranians are capable like anyone else of being galvanized by religion in the abstract. If they’re driven by hate for America, they’re equally fueled by the simple purity of what the Qur’an demands. Booze is evil, because the Qur’an says so; banks are evil, because the Qur’an condemns usury; non-Muslims are inferior, including Jew-and-Christian “People of the Book”, because that’s what the good book says; you kill for Allah, because he demands so, and because you’ll be rewarded for it in the hereafter. To say this isn’t “real Islam” — or that Islam is really a religion of peace that has been hijacked by Khomeini-like extremists — is rather disingenuous, and Clavell would have had no truck with today’s half truths. No one denies there are plenty of peaceful Muslims (like the moderates under the Shah), but they’re cutting against the grain of their traditions. Jihad still hasn’t been rejected by any of the official law-schools of Islam, and there’s good reason for that: it’s a hard thing to erase. Violence is built into Islam’s DNA. He watched the helicopter, hating what it represented. Its course was almost directly overhead but it presented no danger to him — he doubted if those aboard would notice him, here in the lee of an outcrop — even so, with all his being, he resented the intrusion into his peace, and destruction of his prayers. And as the ear-shattering motor-scream increased, his anger soared. “La illah illa Allah…” He tried to go back into prayer but now the thrust of the blades whirled the snow in his face. Behind him his horse whinnied and cavorted in sudden panic, the hobble making him slip and slide. The pack camel, jerked by the halter, equally in panic, reeled to her feet, bellowing, and stumbled this way and that on three legs, shaking her load and fouling the bindings. His rage burst. “Infidel!” he bellowed at the helicopter that now was almost over the lip of the mountain, leaped to his feet, and grabbed his AK-47, slipped the safety and let off a burst, then corrected and emptied the magazine. “SATAN!” he shrieked in the sudden silence. I will only be at peace in paradise. Pain is nothing, this world is nothing. Today, I will go to the air base to investigate the foreigners and curb them and this Sunni Zataki who thinks he’s Genghis Khan, and this afternoon again I will lead the faithful against the atheist Tudeh, doing God’s work in obedience to the Imam who obeys only God. I pray that today I will gain admittance to paradise, [as the Koran says] “to recline on couches lined with brocade, and the fruit of the two gardens shall be within easy reach”. But here we need to pause. Isn’t this “fearlessness of death” exactly what Clavell esteemed so highly against the Judeo-Christian west? Doesn’t Hussain’s craving for release from life, and disdain for his own suffering, mirror the mindset of Shogun’s samurai? In many ways yes, but as I see it, there’s a curious difference. In Whirlwind the theme is tied closely to martyrdom: one dies as one tries to kill others. Samurai also consider it glorious to die in combat, but karma‘s sweep is much wider. Shogun’s Japanese are seen to embrace death in any number of contexts — and particularly that which is not sought out; death which comes unexpectedly and against one’s will. There is even the ironic case of the samurai Buntaro, who is at the last moment forbidden the ritual suicide he imposes on himself (chapter 25). Buntaro’s case is opposite Yabu’s. He craves death (an escape from “the abyss of life”, as he thinks of it), but Toranaga still has use for him. Buntaro’s karma is to stay alive, against his desire, as Yabu’s is to die, against his desire; neither wanted his outcome; both accept their fate. Neither fear death in any case. The Islamic martyrs of Whirlwind crave death so they can reap eternal rewards. Their will matches Allah’s, meaning they effectively “control” their fate more than Shogun’s samurai, whose gods or spirits are just as likely to overturn expectations in displeasing ways. “Insha’ Allah” is evoked, to be sure, to cope with unexpected horror, as by Sharazad when her father is abducted and executed by a kangaroo court. But he himself doesn’t go to the firing squad saying or thinking, “As God wants”. Karma is more demanding than the Will of Allah, in this sense, and certainly more humbling to the ego. I don’t know if this is how Clavell would have characterized the difference, or if he intended to present the philosophies in quite this way, but it’s what emerges for me as I read the novels. Clavell was a multiculturalist, but not a politically correct one. He recognized superiority when he saw it, and didn’t manufacture it where none existed. He believed the East had as much and better to offer than the West. Whirlwind, however, seems to be an examination of a region and religion one says “no” to in almost every way. Critics have noted how the novel sticks out. Gina MacDonald, for instance, writes that in Whirlwind Clavell does his typically excellent job in “capturing an alien mentality, but he does not help readers appreciate it” (James Clavell: A Critical Companion, p 145). No one, to my knowledge, has really gotten a handle on why, and thus this retrospective. Each of Clavell’s novels focuses on a time and place whose people are fiercely rejecting the West. But his governing thesis is usually that cross-cultural contact can change both sides for the better, and help bring understanding to both. Here that’s not the case. Whirlwind‘s “clash of cultures” doesn’t really change anyone, and yields precious little by way of enlightenment. That last may be the answer at its simplest.